Our guide to Charleston will help you find the best bed and breakfasts in Charleston South Carolina. Steeped in history, Charleston anchors the Lowcountry with Southern charm. This harbor city's past lingers in its cobblestone streets and antebellum town houses and historic buildings. You can also shop for everything from antiques to chic fashions, soak up modern and classical arts, or day-trip to the beaches and marshes. There are tons of great bed and breakfasts in the city of Charleston, our city guide will help you find the best bed and breakfasts. You may have a hard time deciding what to do in Charleston, but we make your decision easy. 27 State St, (843) 722-4243 - Two Blocks from the Market, Two Blocks from Waterfront park. World class dining within one block. Beatutiful building, circa 1814. There are plenty more bed and breakfasts in Charleston. 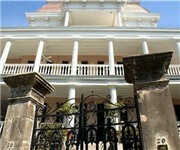 See all bed and breakfasts in Charleston South Carolina.